The State Building Code Act (Chapter 19.27 RCW) requires that each local jurisdiction enforce the State Building Code within its jurisdiction. Any jurisdiction can contract with another jurisdiction or an inspection agency to provide the mandated enforcement activities. Regulatory Process: The Washington State Building Code Council (SBCC) reviews and amends the state energy code for residential and nonresidential buildings respectively. Within 60 days of receipt of a proposed change, the SBCC decides if the proposal warrants further consideration. If the SBCC accepts the change, rulemaking begins and the change is sent to a Technical Advisory Group (TAG) for review. The TAG members have varying expertise in the construction industry related to the proposed change. After completing the review, the TAG submits its recommendations back to the SBCC. The SBCC then makes the final determination on acceptance. Once final approval is granted by the SBCC, the rule is filed with the Washington State Code Reviser and then published in the Washington State Register. The final rule becomes effective after the next legislative session. The SBCC releases proposed changes to the 2012 model building code. The draft code is based on 2012 IECC and has a few Washington-specific elements, including eliminating equipment tradeoffs. The US Court of Appeals for the Ninth Circuit upholds Washington State’s innovative energy-efficiency code for new and renovated homes. The building code, which calls for a 15 percent reduction in energy consumption for new homes, will reduce pollution and save homeowners hundreds of dollars a year on energy. Moreover, it is a flexible code that offers builders a host of options for meeting the state standard. The city of Seattle tests a new performance-based energy code in South Lake Union, with the goal of “helping developers of historic buildings meet rigorous energy efficiency goals in the most cost-efficient way”. A bill (HB 1388) is introduced in the Washington State Legislature that would halt the current implementation of the 2009 Washington State Energy Code (WSEC) – effective since January 1, 2011 – and postpone implementation until at least April 1, 2012. This bill eventually dies in the House. Seattle’s mayor signs Ordinance 123430, adopting the 2009 Washington State Energy Code by reference and also contains the Seattle amendments. The SBCC votes to set the implementation date of the 2009 Washington State Energy Code (WSEC) for January 1, 2011. Although the code was originally scheduled to take effect July 1, 2010, a lawsuit filed in May by the Building Industry Association of Washington (BIAW) and a request to delay by the Governor and others in June led the SBCC to temporarily delay the implementation date at least until October 29, 2010. (The U.S. District Court of Washington dismissed the BIAW lawsuit on February 7th.) The SBCC also decides to begin its regular rulemaking process to determine whether implementation should be further delayed until no later than April 1, 2011. On July 7, the SBCC files a proposed rule with an intended date of adoption. The SBCC holds a public hearing on proposed changes to the 2009 WSEC in Spokane. The SBCC holds a public hearing on proposed changes to the 2009 WSEC in Renton. Senate Bill 5858 becomes effective as Chapter 423, Laws of 2009. This legislation relates to reducing climate change in the built environment. Among other provisions, it updates the Washington State Energy Code. 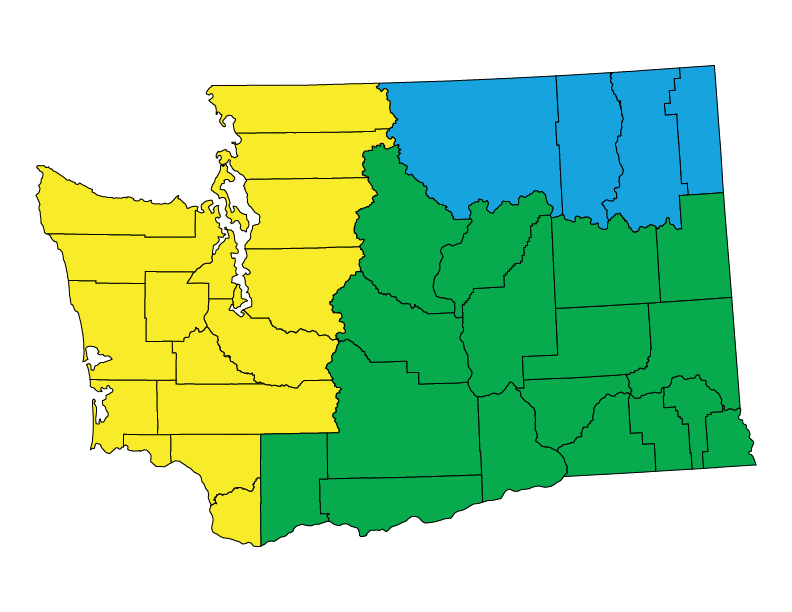 The 2006 Washington State Energy Code is made effective after being adopted in November 2006. For low-rise residential construction, its stringency exceeds the 2006 IECC standards. For high-rise residential construction (four stories or more), the WSEC is more stringent than ASHRAE 90.1-2007 in all respects. For commercial buildings, the WSEC is roughly equivalent to ASHRAE 90.1-2004, save for equipment and lighting standards, which are somewhat more stringent. SBCC adopts amendments for non-residential occupancies. Non-residential envelope, equipment, and lighting requirements are increased and exceed ASHRAE 90.1-2001 standards. The first statewide energy code is adopted. It is applicable to all new buildings and is based on ANSI/ASHRAE/IES Standard 90A-1980. The State Building Code Act and State Energy Code Act (SECA) are passed by the legislature. The State Building Code Act gives rulemaking authority to the SBCC, which oversees all building and energy codes within the state. Washington’s first energy code, adopted by statute, is a voluntary requirement.